Wholesale Personalized Drawstring Backpacks with Pockets, Custom Printed or Blank. Promotional, Inexpensive, Budget Prices for USA, Canada. Bulk Drawstring Backpacks with large front pockets and made of sturdy 210 Denier Nylon. It may be carried over the shoulder or as a backpack. Our sturdy pocket drawstring backpacks are currently on sale: 35% reduction from the regular price! Budget Prices in USA for wholesale pocket backpacks. Backpack Colors: White, Burgundy, Pink, Black, Kelly Green, Lime Green, Forest Green, Navy, Orange, Red, Royal, Light Blue, Purple, Gray, Teal, Sun Yellow, Athletic Gold. Unit prices below are for drawstring backpacks with 1-color custom imprint. Free artwork design. We will send you a proof for your approval before production. 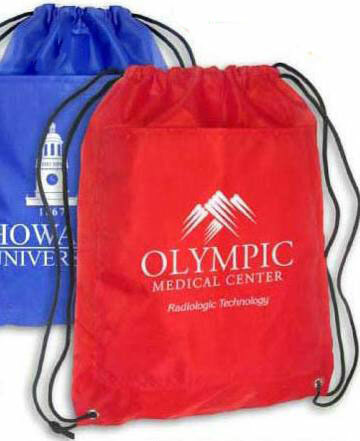 We also supply blank (not imprinted) drawstring backpacks with pockets for $1.72 each.